This is Tom Stewart again and I am hoping to take a few minutes of your time to discuss a topic which has only a very slight Macintosh bias. There is no problem to be solved here, merely a way to use our computers for fun – I am talking about flying around the world on your Mac. I can sit at my 27” iMac and fly wherever I want, whenever I want and it can be an incredibly immersive experience with some of the software, hardware, and services available. The first thing you need is a flight simulator program. Laminar Research produce a flight simulator program for the Mac called X-plane. This is available for download at X-plane.com or by using Allison’s Amazon link for a DVD version. The base product comes with 30 different aircraft to fly from gliders to the huge 747 and you can start and end your flight at one of its 33,000 airports. X-plane is a very realistic simulator and is not a game – so for a beginner I strongly suggest letting the AI fly the plane for your first few flights. It can start the plane, taxi out and take-off before you turn off the AI and take control. You can then turn the AI back on for your landing. As you become more comfortable with the controls and the cockpit you can take on more and more of the responsibility. There are numerous tutorials and resources available online showing you how to fly and that first landing can be a real thrill. Eventually with time and research you can learn how to enter the cockpit of your virtual 747 and run though the various checklists to get the plane fired up, the systems programmed, the radios dialed to the correct frequencies, and even set the right temperature for your passengers. You then taxi the plane to the runway, take-off, and fly to your destination. Naturally the four seater Cessna 172 will take much less time to learn and master. If you decide you enjoy virtual flying and want a new challenge, or more realism, there are numerous software add-ons. X-plane’s open architecture allows the developer community and large user community to produce numerous additional planes and photo-realistic scenery. Some of these are free while others need to be purchased. 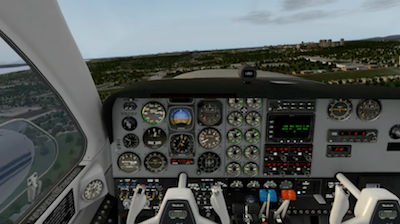 All of the add-ins work on both Windows and Mac versions of X-plane – true equality. Moving the experience up a notch there is a program called Shared Cockpit which plugs into X-plane and allows me to fly with a co-pilot. My son, who lives 3,000 km away (and uses Windows), and I use this to fly virtually side-by-side. We are flying the same plane at the same time. One of us can handle the controls, the other the radios and switches – just as in real life. Any action taken by one of us results in the action being mirrored to the other. We can chat over our headsets and both can talk to or hear any communications with Air Traffic Control. Yes – there are even live Air Traffic Control services available to simulator pilots. I have been using a paid service called PilotEdge. It provides live air traffic control for pilots who are flying virtually in Southern California. The controllers can see your plane on their virtual radar scopes and will provide clearances and instructions identical to what you would receive in a real flight. After you get your clearance to taxi from the ground controller, you will talk to the tower controller, who will hand you off to the departure controller once you are airborne, and so on. The controllers provide any necessary Instrument clearances and expect the pilots to conform to the proper procedures defined by the FAA. You can hear the other pilots who are on the same frequencies as they conduct their flights and you actually see their planes on your screen as they pass. Needless to say X-plane with Shared Cockpit and Pilot Edge makes an immersive experience and an excellent training ground for would-be pilots. The student can learn aircraft control and procedures, navigation skills and radio protocols, with a more-experienced pilot at their side, without the need to rent a real plane or even drive to the airport. No need for a fancy or high-powered gaming machine although more memory and faster processors will enable you to increase the degree of detail for the terrain you are flying over. I was running X-plane on my late 2009 iMac with no problems. X-plane itself sells for $60 but if you really get into flight simulators and want to put more money into it, there are hardware peripherals available for the computer pilot: items such as a joystick, steering yoke, rudder pedals, and so on which can add a lot to the experience. For a more game like experience Microsoft Flight Simulator X, which is Windows only, is probably a better choice. However the granularity of the settings in X-plane and the great flight characteristics make it the better choice for me. Besides – it runs on MacOS. If you want to take a look you can download a free demo from X-Plane.com. I’ve owned and used X-Plane 9 and 10 and I didn’t know it was capable of some of these things! The generic UI can take a bit of getting used to, but once you’re in the cockpit and ready to roll, it’s a joy to fly.